The new generation Socorex Calibrex organo 525 and solutae 530 Bottle Top Dispensers are intended for safe and reproducible liquid distribution of volumes up to 25, 50 and 100 mL. 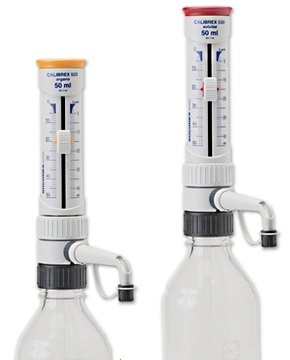 The yellow coded Calibrex™ organo 525 dispensers have ground glass plungers and are best suited for organics, non-crystalizing acids and base solutions. The red coded Calibrex™ solutae 530 dispensers have PFA coated plungers, preventing plunger and barrel from seizing together. 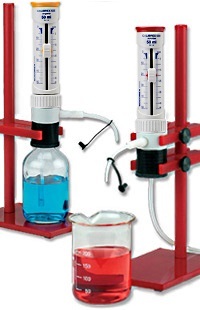 This property allows trouble free distribution of salt solutions, weak and strong acids and bases. 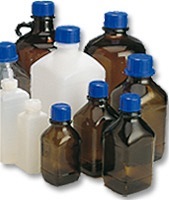 Each unit is supplied with 45 mm base thread and 1 each of 32, 38 and 40 mm adapters for most common bottles. Also included is a delivery jet, feed tube and a calibration certificate. Available with stopcock and without stopcock, in fixed volume, and with an optional 150 mm delivery jet.